On the night of April 17th, just one day after the entertaining back-and-forth battle between Victor Ortiz and Andre Berto, I asked this question on Twitter: “Do you ever watch a fight with KOs and knockdowns to see the reaction of the crowd who have a vested interest in it? #boxing.” I asked this because, admittedly, I do. All the time in fact, especially when a certain promoter is involved in a fight, like he was the evening before. It seems I'm not the only one. - @BigA2417: "everytime I watch a DiBella fighter I tend to rewatch the DVR, he can be fascinating to watch." - @iiReal: "great stuff, DiBella has the best reactions. Especially when Sergio KO's people." - @7Cadillac7: "U mean like watching DiBella ringside as Berto is getting pounded on? Now that's PRICELESS!" - @JasonTO: "Sergio-PWill II was the best. The replay of the KO caught DiBella and Goossen on the same frame. It was beautiful." Whether it's the thrill of victory (Sergio Martinez starching Paul Williams) or the agony of defeat (Berto being defeated by Ortiz), you can always see how the fight is playing out for his man, just by watching the passionate New Yorker in his front-row, camera-side seats. When asked if he was ever aware of just how emotional he gets, Lou DiBella told Maxboxing, "I mean, I'm not really paying attention to it. I'm not playing to the camera but it's sure pretty funny. But someone gave me- Angie Carlino, a photographer in New England- a photograph of me at two different fights; one was a Micky Ward fight and one was an Arturo Gatti fight and they were both from the ‘90s and you could see- and other than being the guy who was telecasting the fight- me in the first or second row jumping through the roof also." Going back to his days as an executive at HBO, where he created the “Boxing After Dark” franchise, DiBella has no hesitation in stating, "I'm a fan, man. That's what differentiates me from some of the other promoters. I actually watch “Friday Night Fights”; I watch other people's fights. If you follow me on Twitter, I tweet about fighters I have nothing to do with and I either give them their props or rip them as I see fit. I'm a fan. I guess the second people stop seeing me jump up and down, you can pretty much count on me being out of it within a year or two because the truth of the matter is, I hate enough about the sport and it's still the fact I can get excited about it now and then that keeps me in it." Say whatever you will about DiBella, the guy loves boxing (This was confirmed to me back in the late ‘90s when he had to get off the phone quickly with me more than once because “Heavyweight Explosion” was starting in a few minutes. If you subscribed to those cards, you were a bona fide boxing fanatic). On the flipside is Bob Arum, who has a poker face that would make Phil Ivey fall for his bluff. No matter what is going on in a particular fight, Arum is stone-faced throughout. "I maintain my cool, particularly in those fights where I'm the promoter of both fighters," he said. "I think it would be unseemly during the course of a fight to betray my emotions, so I'm able to bottle them up and just concentrate on the fight." Years ago, he even told his wife, Lovey, to remain as neutral as possible in that setting. "I told her to not show emotions while the fight was going on; don't distract people and so forth. Just sit there and watch the fight. I've always known that. That's how I've always watched the fight." If you watch a big card on pay-per-view, HBO or Showtime, the first row or two will seat the promoters involved in the event, sponsors, celebrities and network executives, who themselves have to be aware that every reaction they have is there for the world to see. Ken Hershman, the “Boxing Czar” of Showtime says, "Well, I guess you gotta be cognizant," he said, laughing at the thought. "Especially at the ‘Super Six,’ I was very cognizant because each side accused me of taking the other side. But yeah, sometimes the emotion overtakes you; the excitement overtakes you and you just get into the event." It's become customary to see the big power brokers on camera but it wasn't always so. According to Arum, who's been in the business for over four decades, it’s "quite the contrary. The promoter sometimes sat in the press section, never sat on camera- never. That changed with the advent of Mr. King, who insisted on camera- in the center." Arum, of course, is referring to his old colleague and archrival. The thought of it has Arum chuckling. "That is something that was created by Don King. Because most of the big fights in the older days were done, say in Madison Square Garden, and the best seats to watch a fight in the Garden, were the ones that were slightly raised off-camera on the side, the short side. Those were the premium seats. If you wanted to watch a fight- not just be seen- those were the best seats. "Just the way the best seats at the MGM Grand are the ones in the center of the raised seats," Arum points out, "but people want to be seen and we used to have, at MSG, to sit in those seats where you were seen, Frank Costello, people like that. But Mr. King made it a practice that he would sit front and center and then Bill Cayton insisted on that- put it in the contract- and then that became what everybody did. Those seats were actually in the contract that you had to have, like, not only first or second row but they would have to be right in the center. I mean, crazy sh*t."
When a fight is a co-promotion, Arum says, "You sit down with the co-promoter and you then arrange for him to have seats right next to each other. If you didn't give him a seat, then there would be a fight but if you give 'im a seat, there's no fight." As for the network’s tickets, Hershman says, "It depends on the event but we ask for- as part of any deal- a certain number of seats in certain locations to make sure we can take care of the people we need to take care of." So now, it's a matter of tradition and prestige (if not the best vantage point) to have these seats. In other sports, you'd have to look into a luxury box to see the reaction of a team owner during a game. In boxing, it's right there in front of you at all times. DiBella is the most fascinating and entertaining subject to watch because he doesn't just wear his emotions on his sleeve; they are draped all over him like an oversized trenchcoat. There have been some great DiBella moments at ringside, like his jubilation over Martinez's vicious knockout of Williams last November in Atlantic City, where he didn't hesitate to start making his way over into his fighter’s corner and eventually into the ring, passing the likes of Goossen, Al Haymon and HBO execs who were in stunned disbelief over what had just occurred. There was also his unbridled joy over Bernard Hopkins' victory over Felix Trinidad, while he still represented “The Executioner” in 2001. Just wait a few minutes after the conclusion of the fight and look into the crowd and you don't have to be an expert at Where's Waldo? to find him. And who can forget him basically tackling Paulie Malignaggi after the Brooklynite won his title against Lovemore N’dou? Then he engaged in what Keith Olbermann would call “premature jocularity” as Jermain Taylor sent Kelly Pavlik to the deck in the second round of their first fight in 2007. As the count reached six and seven, DiBella had already positioned himself to jump into the ring and celebrate. Less than a half-hour later, Taylor was stopped by Pavlik. During the sixth frame of Ortiz-Berto, as Ortiz was knocked down and with Berto seemingly having all the momentum of the fight, there was DiBella on his feet, screaming. As Ortiz returned the favor later in that round, DiBella looked just as deflated. It was the gamut of emotions, two dramas taking place in and out of the ring. "People ask me if I gamble and the truth is in real life, I really don't very much, like occasionally, the NCAA's or the Super Bowl or something," said DiBella, "but I don't gamble because my whole business is a form of degenerative gambling. I mean, the truth is I make the opportunities for my fighters and if they don't come through and they don't win, then my business suffers greatly. Boxing- if you're a promoter- is a form of degenerative gambling, every fight. So I tend to get too personally involved with my fighters and I forget the old adage, 'Never fall in love with your fighter' because he'll f**k you, basically. But I fell, too, in love with my fighters because I feel like I have a personal stake. But I have to be honest; often, I sit there and I'm just seeing a great fight, seeing great action, if I'm part of it, I'm happy because it's not going to kill any of my fighters to fight a 'Fight of the Year' candidate." And don't worry, fans; DiBella isn't moving off camera-side anytime soon. This show isn't going to end anywhere in the near future. "I actually think I occasionally make a difference. I'm screaming at the top of my lungs when Andy Lee seemed to be in a haze (versus Craig McEwan). More than that, it's not about being seen. Hey, look, I'm used to sitting in good seats. I'm not going to sit in bad seats now. I don't care so much about being seen on TV but I'm going to react like I'm going to react as a fan." DiBella laughs as he says this but he means every single word. "I gotta tell you something; I'm a fan. The first thing I did after the [Ortiz-Berto] fight was to go see if my fighter was OK and the second thing I did was go into Victor's dressing room and congratulate him. Look, I was stoked that night because it was a great fight but I don't think people saw him looking like I was killing myself because I knew that wasn't the worst night ever for either guy and that when you fight a fight that good, then you're going to get your props in the sport and get elevated." In case you haven't heard, services for Genaro Hernandez, who passed away last week after a valiant fight against cancer at the age of 45, will take place on Monday from 11 AM to 3 PM at the Resurrection Church (3324 Opal St. in East Los Angeles, off the cross streets of 8th and Lorena). Here's what I had to say last week about his life and passing: http://www.maxboxing.com/news/sub-lead/its-true-the-good-indeed-die-young. Just a short story I wanted to share with you regarding Genaro Hernandez. My children and I were at the fight the night he lost his title to Mayweather. He had been beaten and definitley looked the part at the end of the fight. As he and his brother were making their way through the casino, my daughter stopped him and asked if he would take a picture with her. 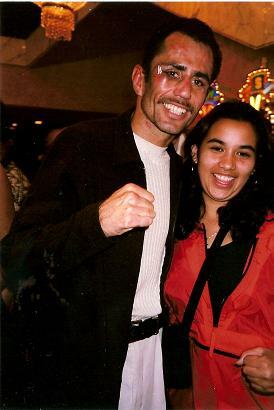 I thought, "oh my god, that's the last thing he'll do" and as I was about to chastise my 14 year old daughter for even asking such a ridiculous question, Chicanito stopped, smiled that huge smile of his (the swelling had already taken ahold of his eyes and face) and posed for a picture with her. I will never forget that classy moment and never has she. I felt such sadness at his passing. I would hope that you could share this story with his family. Thank you. This isn't set in stone but I was told over the weekend that there is a chance that HBO, in addition to broadcasting the WBC heavyweight title tilt between Vitali Klitschko and Tomasz Adamek from Poland on September 10th, is going to air a bout involving Yuriorkis Gamboa from Atlantic City later that evening to go with the replay. Also, the return of Julio Cesar Chavez Jr. could land on September 24th. The names being kicked around the most prominently are Peter Manfredo Jr. and Darren Barker. Houston and San Antonio, Texas could land this bout. Floyd Mayweather and Bob Arum may not see eye-to-eye on much but they both did some great things in relation to the fallen Hernandez. Arum paid for Hernandez's medical treatments throughout this ordeal and Kevin Iole of Yahoo! Sports reported that Mayweather will be footing the cost of the funeral...Based on all the empty seats I saw the Roseland Ballroom on Friday and Saturday night, I was wondering if the Puerto Rican Parade was called off in New York this weekend...I think it's clear you can't just showcase Puerto Rican boxers; you have to showcase a Puerto Rican star on this date...In any other division other than cruiserweight, is Lateef Kayode anywhere near ready for a title shot? He's still got a ton of rough edges to smooth out...Speaking of the 'Rican boxers, of all the guys I saw, I think Thomas Dulorme has the most upside and Lou Del Valle has the chance to be the most crowd-pleasing...Here is the link to the most recent edition of MaxBoxing Radio with Corey Erdman and yours truly: http://radio.thescore.com/episodes/maxboxing-radio-mayweather-ortiz-announced...So five NFL teams have inquired about Los Angeles? Geez, am I the only one who doesn't care if our great city never gets an NFL team here or not?...Great to see season two of “Master Chef”; I can watch just about anything with Chef Gordon Ramsay on it... .